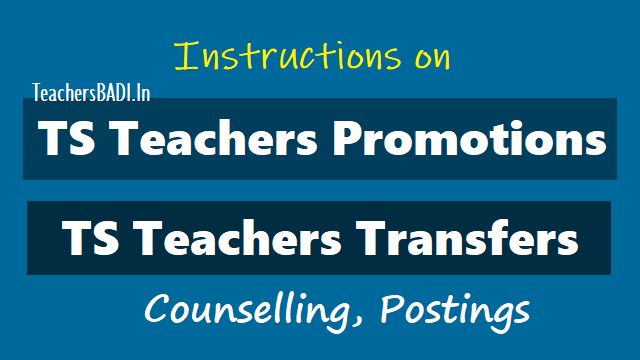 TS Teachers Transfers 2018, TS Teachers Promotions 2018, TS Teachers Transfers Counselling adn Postings 2018, Online TS Teachers Transfers Counselling, TS Transfers Transfers Online Counselling, Teachers compulsory transfers period should be 8 years. HMs compulsory transfer period should be 5 years. 8 years completed Teachers List and 5 years completed HMs List. Prepare and finalise the teachers seniority lists for promotions as per Management wise, post wise, subject, medium wise, plain or agency area wise. 6. Teachers seniority lists for promotions as per Management wise, post wise, subject, medium wise, plain or agency area wise. 1. Separate list should be furnished Management wise, post wise, subject, medium wise, plain or agency area wise. 2. All the lists should be furnished in Excel format and signed format. 3. Each vacancy should be verified before indicating in list i.e post wise, information wise, particulars wise, etc. 4. Each teacher particulars should be verified before indicating in list i.e post wise, information wise, particulars wise, etc. 5. Habitation category shall be mentioned as stipulated in G.O.Ms.No.12 SE, Dated.16-06-2015 i.e earlier transfer guidelines. 6. Indicate Total Clear vacancies and indicate non viable or surplus vacancies / schools vacancies as per Rationalisation norms separately in column provided. While indicating Clear vacancies non viable vacancies / schools vacancies as per Rationalisation norms, should not be indicated. They shall be excluded. 7. Compulsory vacancies of long standing shall be identified as on 01-06-2018 and compulsory transfer period should be 8 years for teachers and for HMs transfer period should be 5 years and who are retiring within 2 years should be excluded. 8. Number of TRT vacancies notified should be maintained (only number shall be maintained i.e Management, post, subject, medium & Area wise) while indicating the clear vacancy. 9. All the erstwhile DEOs should coordinate with new DEOs and MEOs and prepare desired vacancy particulars. 10. All the RJDSEs should coordinate with new DEOs and MEOs and prepare desired vacancy particulars. Sub: School Education - Teachers transfer counselling & postings - certain instructions issued calling for vacancy particulars - Reg. Read: G.O.Ms.No.61 Fin Dept dated.24-05-2018. 1) Separate list should be furnished Management wise, post wise, subject, medium wise, plain or agency area wise. 2) All the lists should be furnished in Excel format and signed format. 3) Each vacancy should be verified before indicating in list i.e post wise, information wise, particulars wise, etc. 4) Habitation category shall be mentioned as stipulated in G.O.Ms.No.12 SE, Dated.16-06-2015 i.e earlier transfer guidelines. 5) While indicating Clear vacancies non viable vacancies / schools vacancies as per Rationalisation norms, should not be indicated. They shall be excluded. 6) Compulsory vacancies of long standing shall be identified as on 01-06-2018 and compulsory transfers vacancies should be indicated and for teachers compulsory transfers period should be 8 years and for HMs compulsory transfer period should be 5 years, excluding Teachers / HMs retiring within (2) years . 7) Number of TRT vacancies notified should be maintained (only number shall be maintained i.e Management, post, subject, medium & Area wise). 8) All the erstwhile DEOs should coordinate with new DEOs and MEOs and prepare desired vacancy particulars. Further, new DEOs & Staff should cooperate with their concerned erstwhile DEO in whole process of conducting teachers transfers without fail. 9) Number of teachers transferred in year 2015 and not relived due to substitute and teachers Woking against posts or working on Lean shall be submitted in separate Annexure-Ill & IV. 10) The above particulars should be submitted in this office on or before 28-05-2018 through concerned Superintendent with Data Entry Operator. Further, all the RJDSEs and District Educational Officers in the State are instructed to prepare and finalise the teachers seniority lists for promotions as per Management wise, post wise, subject, medium wise, plain or agency area wise. This reference should be treated as MOST URGENT. I declare that I have verified each vacancy, information, particulars and found correct and if any deviation found in vacancy, I am held responsible and liable for disciplinary action.